Many small businesses offer their products and services to a specific geographical market. To be successful, they need to make sure they’re being found quickly in search engines. That’s why incorporating strategies specific to local search and SEO is an important part of creating a well-rounded and comprehensive online marketing strategy. To help increase your chances of getting found by customers, you can start by implementing local search strategies such as creating localized content for your website, claim and optimize your Google My Business page, obtain online reviews from customers, and claim and manage local listings and citations. Rich: She’s a local SEO expert and a Google My Business top contributor. She regularly contributes to many online communities in the local SEO world, including the Google My Business forum, a local search forum, and the Local University forum where she is a moderator. She’s also a contributor to the Moz Local Search Rankings Factor Survey. She’s the owner of Sterling Sky in Canada and is the author of The Expert’s Guide to Local SEO, which is an advanced training manual for people wanting a detailed look at what it takes to succeed in the local SEO space. Please welcome Joy Hawkins. Joy: Thank you for having me. Rich: I’m very excited to talk to you, local SEO is a big thing to a lot of people listening to this show. So how did you get into local SEO, and how did you come to start your own agency? Joy: It was kind of an accidental thing, to be honest. I was going to university for advertising and thought I’d get a job in something related to advertising, but ended up working for an agency that sold Google ads. Google Places – which is now Google My Business – didn’t even exist, but it started coming out and new clients of ours saw these little pins that showed up in the Google search results they kind of became obsessed with it. So I also became obsessed with it and tried to figure out how it worked to rank there, and 11 years later I started my own agency. So it’s been a long road. Rich: Fantastic. So is local SEO a set it and forget it activity, or is there ongoing work? Joy: I’d say definitely not set it and forget it. We do ongoing work for any business that we work with, and we’ve kind of seen that the whole doing everything once and then leaving it alone is normally what will happen with your ranking as well. So you’ll rank well and then you kind of forget about it and you see a steady decline over time. Rich: Is there stuff that you do right off the bat, though? So, I won’t say “forget it”, but is there “set it” work to be done? Joy: Absolutely. There are certain features that you can set up within Google My Business that once they’re set up there’s not a whole lot of maintenance that goes into it. So one example would be Google launched this feature this year called “Messaging” for Google My Business, so you can send an instant message to a business on their listing. But there’s going to be maintenance, obviously once you have a feature and it’s set up. Rich: So once that particular feature – this Google Messaging – is set up, what happens? Somebody is on their phone and they find my local business, they send me a message? How am I receiving that message? Joy: It goes through text messaging, but there are some platforms it supports and certain ones it doesn’t. I believe the technology behind it is Allo, which is another Google product. It’s really easy to use as a consumer, I’ve used it a couple times to message businesses and it comes up like a popup screen. Kind of like Facebook Messenger, is probably the comparison. And then similar to Facebook, Google will show response time right there for you, like “this business normally responds in an hour”, so as a user that’s helpful. Rich: What I’ve heard a lot, one of the first steps of local SEO is what’s often referred to as “claim & cleanse”, where you need to prove to Google and some of the other directories out there that you can speak on behalf of the business. Can you walk me through that? 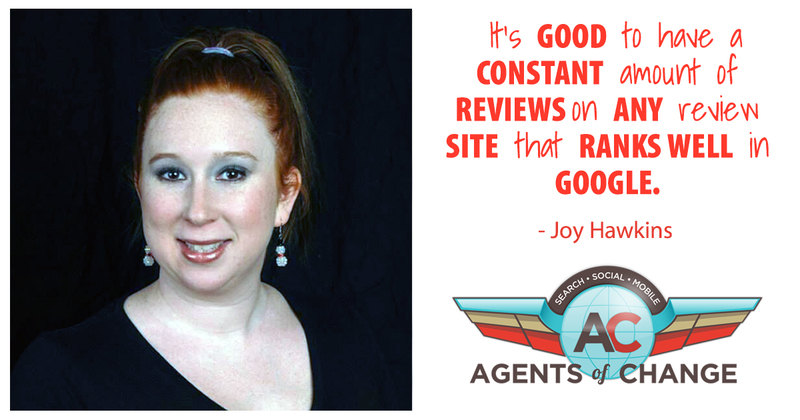 Joy: So with Google, Google has no issues with agencies claiming listings. They are particular about agencies trying to hold the listings hostage. So a general rule of how Google would like to see it used, they’d like the business owner to really be the primary owner on every listing. So in cases where the business owner has not verified their listing, it really should be an email or Google account that that business regularly checks. I know in the past agencies would often just make a random Gmail account for a business. But the problem with that is now the business owner isn’t going to get anything to do with their listing if they don’t check that email. So it’s always best to use the business owner’s email as the main primary owner, and then you can add yourself as the manager or co-owner, whichever serves your interests best. Rich: Besides Google, what other companies should we be reaching out to to kind of claim ownership over a business? Joy: I’d say definitely Yelp. Yelp also has a similar platform now for agencies so you can add multiple users on the same listing. That’s a newish feature that’s come out this year. Usually Facebook is one that we say is god to have control of for responding to reviews and things like that. And then depending on the industry and location, there are a lot of niche websites that are super important in certain verticals. For example if you’re an attorney, you definitely want to claim your listing on lawyers.com and a bunch of other sites. It really varies depending what industry you’re in. Rich: Alright, so you are going to do some research into your own industries. And does it, how about these local guides and stuff like that, things that might talk about businesses in Portland, Maine or Portland, Oregon, or Ontario, Canada? Are there specific ones that we should be looking for and kind of reaching out to, or do they come and find us? Joy: Local Guides is a pretty broad program now, to become a Local Guide is super easy. My husband is a Local Guide and let me tell you, he doesn’t do this for a living or do anything special to get that status. So really anyone can kind of join the program. Having Local Guides review you isn’t really anything that makes a ranking benefit that we’ve seen. Even reviews from local guides don’t rank just normal user reviews that haven’t joined that program. Rich: Ok this is interesting, because when I said “local guides” what I was envisioning is there might be a website out there that’s called PortlandMaineBusinesses.com, which would basically be kind of a niche-y website that basically links out and has some data about all these different companies. What are you talking about when you’re talking about Local Guide? Joy: Ok, sorry. There’s a program through Google Local Guides that’s basically users that use Google maps either leave reviews, ask on the listing using the Q&A feature, also they can post photos. All these things get points, but to be honest the point system it’s not like you really win anything by getting more points. But there’s like minimal benefits, you might get a free Google Play movie rental or something, but we’re talking really minimal. Rich: Well wasn’t it Napoleon that said something about, “I’ve discovered the most amazing thing, men will die for ribbons”? So maybe people will die for fake internet points. Rich: Alright, so we talked a little about some of the setup work that we can do as far as SEO goes. Let’s talk about some of the stuff that we should do on a monthly basis. What do you do for your clients, or what do you recommend businesses do to keep up with either the changes or just to show to Google we’re still a relevant business? Joy: So I guess there’s a list of things that we just do on an ongoing basis that have made a big impact in SEO for a long time. So those would be things like optimizing the website, keeping content on the website current. For example, for certain types of services or products we’ve seen that you can get an increase in click through rates if you have the current year as part of the title tag. So in order to keep our client’s information current we’ll do that on the pages and things to make it look current. Rich: Can you give me an example? Sorry to interrupt. So if it was things like “Bed & Breakfast 2018 rates”, or something like that? Joy: Yeah. So the great giant in this space that does this so well is TripAdvisor. If you type in “things to do in Seattle”, TripAdvisor normally ranks and this is one of the things they do with their landing pages, “The 10 Best Things To Do In Seattle 2018”. They do it because it works, it helps, so they’re constantly updating stuff and making it current. Or they have it automated somehow. So definitely keeping existing content updated is a big huge part of it, and obviously getting new backlinks. These are all SEO tactics that most people are aware of. On the local SEO side we do things like Google posts. That’s something that definitely would be ongoing. Google Posts are a feature that Google launched last year, but they only stay on your listing for 7 days. Rich: And for people who aren’t familiar with that, I believe you go into Google My Business and then you can create these little posts. Not much different than a tweet or a Facebook update or a LinkedIn update, correct? Joy: Of course Google’s been making a lot of updates to this feature. So last month they made it so now when you open up a listing on a mobile device, Google Posts are at the very top. They are above the location information and reviews and everything else. So they have really highlighted that feature. And this month in May so far, Google has already made it possible for posts to include videos, that’s something that launched a week ago. And then just earlier today now they’re rolling out offer posts to everyone so you can post – kind of like a coupon – an offer that had a code and everything on it. So they’re really investing a lot into making this specific product have lots of features. Rich: Now here for our own agency we’ll have a blog post and then we’ve got a list of things where we’re going to promote it, and we’ve added Google Posts to that. And now I’m thinking as you’re talking that I’ll do a little video introducing every single blog post as well, and then we can set that up to our Google Posts as well. Joy: Yeah, definitely test it. See what works well for you, because I’ve seen a variety of different strategies that work well. Just make sure that when you’re doing Google Posts, I always tell people to use UTM codes in the URL, so that you can track in Google Analytics exactly what happened after they clicked on the button and see if they converted or filled out a form or whatever. Rich: That’s a great, great tip. So we talked about keeping your website current in backlinks, which you mentioned are both local SEO tactics, so obviously SEO is part of local SEO. What other things should we be considering on a monthly basis for improving our local SEO? Joy: So something I actually changed my stance on very recently was the concept of reviews. It’s a generally know practice that in order to succeed in the local SEO world you have to have a constant flow of reviews. So constantly asking your customers to leave you a review on Google. We use a company called GetFiveStars to automate all that for our clients. But one question that would constantly come up is people would ask, “Do you respond to every review?” And typically the answer is “no” because the responses form the business owner kind of are sort of visible underneath the review, but the current person that left you the review wouldn’t even know that you responded, so I felt that the impact was kind of minimal. And then the responses don’t impact ranking, so it’s like, why bother. But recently as of a few days ago, Google is now alerting users when a business owner responds to the review. So that user will get an email from Google saying the owner has responded, so now I’m like, that changes everything. If they’re actually going to see your response, it totally makes sense to respond to customers and thank them and show that you actually care and see that they left you a review. Rich: Absolutely, that makes a lot of sense. So you’re using GetFiveStars, what is that exactly? Joy: It is a reputation monitoring platform, there are a lot of them out there. We went with GetFiveStars because it’s owned and operated by two giants in the local SEO world, which is Mike Blumenthal and Aaron Weiche, both – definitely Mike – who have way more experience than I do, he’s been in this game for a long time. So they’re constantly keeping their tool updated and current with whatever Google is doing, and also following their guidelines, because they have a very strict set of guidelines for review solicitations. I’ve seen clients that have broken those guidelines, and as a consequence lost a lot of their reviews, they got removed for breaking terms. So make sure whatever company you’re using is aware of Google’s practice for reviews and what you can and can’t do. Rich: For the reviews you mentioned that a steady stream is a positive thing, does it make a difference if these reviews appear on Google or can it be reviews on Yelp, reviews on Zagat’s, reviews on our own sites? Do these other sites matter as well? Joy: I would definitely say so. If I see a business that only has positive reviews on Google, but then Yelp says they’ve got a 1 star average, that is a big problem. It’s good to have a constant amount of reviews on any review site that ranks well in Google. So that would include Facebook, Yelp, and a bunch of other ones that rank for specific industries. YellowPages.com is another generic on that normally will rank a business name when you type in their business name it will show up. Yelp is probably the trickiest though, because Yelp has a policy against full sitting reviews and they actually have a penalty if they catch you doing it. So they are by are the hardest one to get reviews on if you are a local business. Rich: Can you talk me a little bit about citations and what the difference is between citations, and reviews, and links are, and how it impacts our local SEO? Joy: Yeah. They’re really all the same. 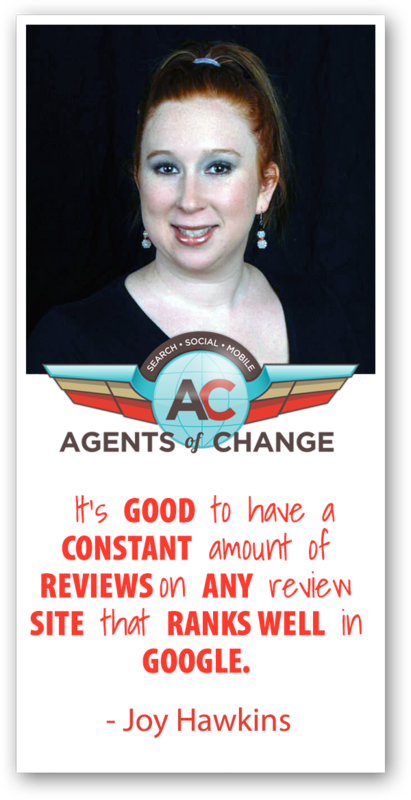 You take Yelp for example, that’s a citation, and a link, and a place to get reviews. A citation by definition is just a mention of your business name, address, and phone number all together. A Yellow Pages listing doesn’t always have a link, there are some sites out there that would list information for a business but would not link to their website. And then a review platform would be a place that generates its own reviews and I would say that there is a lot of them out there that don’t really matter. The ones we focus on are ones that either users know exist – like Facebook – , or ones that rank for brand name on Google. Rich: Ok. So is citations then kind of an umbrella term, and some citations might have reviews and some citations might have links? Joy: Correct. And I would definitely say the ones that we see as more important are the ones that have all, a citation, a link, and a review. Rich: So I might get a citation in the Yellow Pages – maybe it links to me, maybe it doesn’t – and it has my business information, but then let’s say I also get interviewed for an article in the local paper, and that’s online. If that said “Rich Brooks from flyte new media”, is that considered a citation, is that like a data point that Google pays attention to? Joy: Yes, and probably more so connected with your listing if it actually lists your address or phone number. They look for those things as well as just the name. A lot of these studies are old, but I’ve seen a lot of people that do citations and that’s kind of the main focus of their agency. You mentioned how some of these unstructured citations actually help ranking, I’m not really certain it makes a huge impact anymore, but it’s one of those things that most businesses still have this desire to get themselves listed in a lot of places. As far as what impact that makes when you’re listed on some of these random sources that you’ve never even heard of, I think it’s minimal. Rich: That used to be the thing, you’d get an email saying, “sign up here and we’ll put you in a million different websites or search engines”, and then it turns out there’s only three that even matter, probably there’s probably only one. Now it sounds like I’m being told there are all these sites that are generating the content for other websites and these are important to get into, and I hadn’t even heard of them out there before now. I guess you should know which ones you need to pay attention to and ignore the rest. Joy: Yeah. I always tell people use what you think as far as common sense when it comes to which sites to get listed on. But I mean I came across a site called Hot Frog, for example, which if you asked if I had ever heard of it I’d say probably not, but it’s a site that I know showed up on a lot of lists of citations to build. I’ve never seen it rank high on Google for anything I’ve searched for in the last year. So I’d say the traffic to Hot Frog is minimal. If the users don’t know it exists and it doesn’t rank well on Google, how is anyone supposed to find iy? Rich: So that’s an interesting one because Hot Frog is one that keeps popping up, and the guy in my office that handles a lot of the local SEO said he’s never even heard of this. And I think Hot Frog might be one of the ones that you have to pay for and he asked if it’s even worth it, and I’m like, I’ve been told it’s really worth it and we should do it. So it’s one of these things where it’s interesting to hear you say that you’re not sure that there’s a lot of value there. Joy: What I normally do when I start to work with new businesses is search the brand names of some of their competitors – just to get some ideas – and just look through the first page of the results. No one is going to go past the first page, very few people are going to go past the first page of results. So if the site isn’t on Google’s first page, the importance level drops to if we had absolutely nothing else to do. We prioritize our tasks based on what’s going to impact the business first. Rich: Alright, so that’s interesting. So if I am doing this on my own and I choose 3-5 of my own competitors and I do a search on their brand name on Google, and we find out the sites that are listing them, those are the sites to make sure that I get listed in as well. Is that what you’re saying? Joy: Yes. That’s the way to do it. Rich: Alright. So when we think about local search, I’m very much thinking about the 3-pack that’s in the group at the top of the group of pages when I search. But there’s obviously other opportunities, and sometimes the local pack doesn’t even show up. What tips do you have for ranking well in general for when there is no local pack or when we can’t seem to crack the top three? Joy: Yeah, so we use a ranking tracker which is probably the best or easiest way to figure out what keywords actually serve the local results or not. We use Bright Local for all of our clients. What I like about their tool is they’ll scan ranking reports for a list of say 30 keywords. Each keyword that has a 3-pack it will list the little Google My Business icon. So we can easily scan the list and see which has a 3-pack and which does not. And for the ones that don’t serve a 3-pack, it’s really a matter of figuring out who the actual ranking companies are and how big of a site you have to be to outrank them. One example would be in real estate. I’m doing a presentation for a real estate meeting I’m going to be at in July, and if you search “homes for sale”, you don’t get a 3-pack. If you search “realtor” plus city, you generally do get a 3-pack. But the organic results are dominated by realtor.com. So as a real estate agent you may look at that and say I probably don’t have the budget to compete with realtor.com, so that’s probably not a keyword I would focus all my time and effort on. I would go for ones that are slightly easier to achieve first, if that makes sense. Rich: Yeah, definitely going for more long tail and niche-y topics like that, and not putting all your eggs in SEO in general. Rich: So what mistakes would you say are most common right now? When people make mistakes in local SEO, what would you say the big mistakes are right now? Joy: I’d say one that we constantly see is this concept of a blog and how it’s important. Actually, there’s a couple pieces to this. So a business will have a SEO company that posts 5 times a month for them. And these are articles that in Google Analytics are bringing zero traffic to the site, oftentimes just the same thing posted over and over again. That’s one of the worse things you can do as an SEO strategy. What it ends up doing is telling that your entire site is low quality because there’s nothing really creative that goes on there. That is one strategy that surprisingly we still see a lot. And then some people think they’ve got this blog post and they’ve got to go to Facebook and create a post. Whereas we see on Facebook the average reach for a post on Facebook is very small unless you’re paying to advertise. We don’t do a whole lot with Facebook posting for that reason. If it makes sense to advertise on Facebook for that business, then I would go the advertising route before investing time posting articles. Rich: That’s really interesting, especially the blogging thing. When you said that blogging wasn’t important, I immediately got upset, but then you explained. Because I’ve seen a local foot podiatrist say, “If you’ve got foot pains in beautiful local Scarborough, Maine…” and I’m just like, that’s not even real content, that is literally just feeding garbage to the pigs at that point. But your point is that all those poorly written, poorly thought out blog posts actually have a negative impact for search engine visibility. Joy: Right. Normally when we look at client sites we’ll see some of their articles do amazing. Like, if it’s a topic that’s widely searched – like for attorneys – a lot of times it’s a description of what the specific law means or what you need to know about that law and how it affects you, and they go into detail and break down all kinds of different scenarios. Those types of pieces do awesome. But the kind you’re describing definitely doesn’t help at all. Rich: One of the thing that a few of our clients and a number of businesses out there, these service area businesses. So it could be propane delivery, or we tend to do a lot on the wedding industry, and the photo booth rentals. So we talk to guys that run photo booths and they say they want to put up a page for every single town that we’ll deliver to. And that’s every town on the east coast that just seems a little excessive. What kind of recommendations, would you say to write up individual pages about Boston, and New York and Manchester, NH, and any big city in your area and talk about the kind of stuff you do when you go to that city, or do you just leave that alone? Joy: We do but we don’t do it at scale. And we always try a few before expanding, because there are some industries that we can get to rank with minimal effort, and in some industries it’s almost impossible to rank. So attorneys, for example, getting a service area page for an attorney to rank is next to impossible, it’s very difficult because you’re competing against all these other websites in that city that are targeting their homepage. And as a inner page, you don’t have the same authority as a homepage. So it really depends on what industry it’s in whether it’s going to work to not. So we always try 2-3 and see how they go and see how much traffic they generate. The tricky thing is how do you build links to service area pages. It’s very difficult to do it naturally. WE’ve found that the reach that they get over time is kind of decreasing. Rich: That actually makes a lot of sense. It’s just a struggle obviously if you are one of those service area businesses. Joy: Oh, I know. Good news for service area businesses is Google has been really hashing out their local service ads product and I really thinks it’s fantastic. Yes it costs money, but it costs per lead, so it’s a model that’s actually sustainable for a small business owner. So they’re going to be expanding that to more and more verticals and that is a good solution to the traffic problem that a lot of these guys faced. Rich: And where are those ads going to show up? Joy: They show up in the AdWords section, but they in a lot of cases are actually replace the regular AdWords, and they’re currently in the U.S. for plumbers and locksmiths in a lot of major cities. So if you search, “plumber San Diego”. Rich: So for now it’s specific to certain industries while they roll it out, and then it might be something available to more people? Joy: It’s a really great platform, so it’s good to know that Google is expanding in that industry. Rich: Sounds good. Well Joy, this has been great. I have more questions, I’m sure a lot of other people do too. Where can we point them, where can we find you online? Joy: All my contact information is on my website, which is sterlingsky.ca. I’m very active on Twitter, you can find me there, my Twitter handle is @JoyanneHawkins. But obviously that’s all linked on my website, so I’d just say to start with my website. Rich: Sounds great, and of course we’ll have those links in the show notes as well. Joy, thank you so much for coming by and sharing your expertise. Joy Hawkins loves helping businesses create smart SEO strategies that are proven to give back more ROI. Follow her on Twitter, head over to her website for more of her helpful tips and insight on SEO and local search, and definitely check out her new book. Rich Brooks is the President of flyte new media, a web design & digital marketing agency in Portland, Maine. He knows a thing or two about helping businesses grow by reaching their ideal customers, and to prove that, he puts on a yearly conference to inspire small businesses to achieve big success. You can also head on over to Twitter to check him out, and he just added “author” to his resume with his brand new book!